A few weeks ago, I went to Roger Wilco in search of Harviestoun and wound up with a mixed six of various Trappistes and Abbey ales. The first bottle that I opened was the Trappistes Rochefort 8. Always a fan of products imported by the folks at Merchant du Vin, I was confident that this beer would be good, but I did not know much about the Abbey or the monks. The Abbey of St-Remy, in the southern part of Belgium, was founded in 1230, and the monks began to brew beer sometime around 1595. The beautiful small brewery in the abbey, Rochefort Trappistes, is one of only seven Trappist breweries in the world and makes full-bodied, deeply flavored dark ales. They are bottle-conditioned and among the world’s most highly-respected beverages. Only beers made in a Trappist Monastery, under the supervision of the monks, can use the Authentic Trappist Product seal. Originally called “Spécial,” Rochefort 8 dates to the mid-1950s. The name comes from the original gravity in “Belgian degrees.”Deep brown color; the flavor is vigorous and complex, with firm body to support the strength. The aroma has elusive notes of fresh fruit, spice, leather, and figs. Appearance: Dark reddish brown with nice foam and lacing. Aroma: Sweet malt with a hint of raisins, dates and citrus. Taste: Creamy, roasted malt with notes of dried fruit, vanilla and caramel. 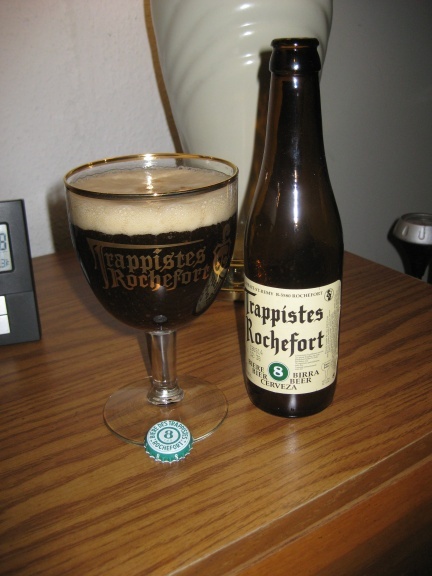 A review of the various beer sites would suggest that the Rochefort 8 is one of the best beers in the world. All I can say is that this might be the best beer that I have ever had. Wow, bold statement! I don’t doubt that you’ve had a few beers in your life, and to say this might be the best… I will have to keep my eye open for it. Do you know if this is widely available, or just at your specialist shop? I’m not sure just how widely available the Rochefort 8 is. I have found the Rochefort 8 in a number of shops in Southern NJ and PA. I hope you can find it near you. You will not be disappointed. Definitely a great beer! Don’t sleep on the 10 either. It’s one of my favorite all-time! I have the Rochefort 6 and the Rochefort 10 in the back of the fridge. Judging by the various sites, they appear to be just a slight notch below the 8. I will have to do some “research” and let you know. Nice review! I keep passing bottles of this stuff but have hesitated to pick one up. That will have to change. Sounds like a fantastic beer!